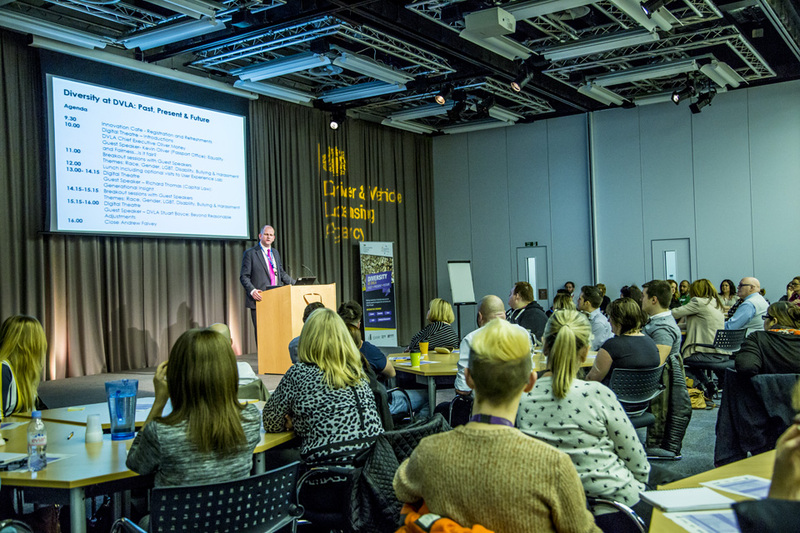 Held at DVLA’s Richard Ley Development Centre, our latest diversity event was to raise awareness of the steps we’ve taken to be more diverse. Over 100 people attended the event to celebrate diversity, and justly so - it helps us create a better understanding of our diverse customers’ needs and will help us create better services for our customers. Attendees included DVLA employees, Department for Transport, local and Welsh government, local universities and the Royal National Institute of Blind People. DVLA HR and Estates Director Phil Busby’s introduction stressed the importance of diversity to DVLA and played an insightful video from our Chief Executive, Oliver Morley. DVLA has come a long way – we’ve got support and networking groups and Diversity Champions at executive team level, as well as a culture of continuously celebrating and improving diversity and inclusion. As Oliver says, “Everyone should feel like they can take part in the story of DVLA’s transformation”. Guest speakers included Kevin Oliver from the Passport Office, who said “Be the person your dog thinks you are”. With over forty years of experience working in diversity, it was really interesting to see his views on reasonable adjustments which can have profound impacts on disabled employees, and the importance of combining diversity and fairness in the workplace. He spoke about Is it Fair? which encourages us to think of others in terms of their abilities and encourages involvement in helping others, even when we do not share common values. Kevin also asked us to “Think about the costs of not making reasonable adjustments”. Richard Thomas from Capital Law discussed the different values, strengths and limitations among different generational groups most notably the ‘Baby Boomers’, Generation X, Generation Y and Generation Z. It was really interesting to see the different values shown by each group and the different approaches to tasks used by different generations. He stressed that human resources policies and practices in the workplace will have to reflect these differences. We all need to understand the background of each generation and exploit their strengths while developing their general weaknesses. As Richard says, the “Key word for Generation Y and Z is flexibility”. DVLA employee Stuart Boyce announced “My line manager gave me a lifeline and I am eternally grateful”. He recounted his personal story about the steps taken at DVLA to help employees with disabilities. He shared with us his struggles with Tourette’s Syndrome and praised his line manager’s flexibility – for allowing him to work from home until he was ready to return. This raised his morale and productivity, and truly exemplifies the business case for going beyond reasonable adjustments and helping people with disabilities to reach their full potential. A truly remarkable story! During the day we split into different Diversity Workshops on the diversity issues surrounding Race, Gender, LGBT, Disability and Bullying and Harassment. I thoroughly enjoyed the level of engagement and interaction in these workshops. We included issues such as barriers faced by certain groups, unconscious bias and how line managers can support employees better from diverse groups and meet their different needs. The Ethnic Youth Support Team (EYST) ‘Race’ Workshop included difficult issues around our perceptions of the religion of Islam and Muslim groups. Our assumptions and perceptions were challenged through fun teamworking activities. Education on the religion helped us to identify unconscious biases and wrongful stereotypes that distort our image of the religion. The key message was undoubtedly to keep an open mind and not let previous assumptions, often affected by the media, twist our judgment. “The speaker was knowledgeable and passionate and his ability to challenge misconceptions and engage with the audience on difficult subjects was really interesting and highly applicable to the workplace” – Talking about the EYST Workshop session. “The speakers were very gifted and engaging and shed light on diversity stereotypes in an interactive and engaging way”. “Inspirational, Enriching and Insightful I thoroughly enjoyed the Conference”.